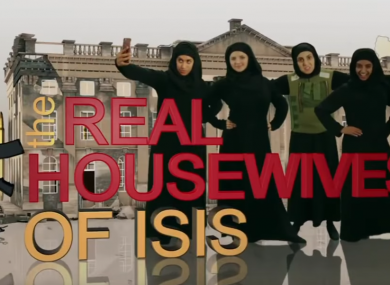 THE BBC SPARKED a social media storm after screening a comedy sketch called The Real Housewives of ISIS, satirising the women lured into joining the Islamic State jihadist group. The satirical two-minute sketch, which featured in the comedy show Revolting, has been seen more than 21 million times and drawn nearly 90,000 comments on the BBC 2 television channel’s Facebook page since airing on Tuesday. The reaction has varied between those who found it “sick” and “tasteless”, causing “pain and hurt”, to others who found it “hilarious”, and lauded it for mocking the “violent, paedophilic, regressive death cult” of Islamic State. The Real Housewives US reality television franchise shows the lives of affluent women in various cities. In the sketch, they are replaced by black-clad British wives of Islamic State jihadists who discuss their outfits, including two women turning up in matching suicide vests. “It’s only three days till the beheading, and I’ve got no idea what I’m going to wear,” complains one. “Ali bought me a new chain which is eight foot long, so I can almost get outside, which is great!” says another, attached to an oven. His co-creator Heydon Prowse said he was “glad the nation (is) discussing this”. Both retweeted the comments of Ali Official, a British comedian of Bangladeshi descent, who said: “The sketch ridicules online grooming and draws attention to an important topic. The whole point of satire is to expose stupidity. Email “BBC causes a stir with Real Housewives of ISIS sketch”. Feedback on “BBC causes a stir with Real Housewives of ISIS sketch”.